Puma Burst purple sneakers without laces for women. With the Puma Burst for Women Puma showed again how to make simple but elegant running shoes. The sneakers are available in purple, black and light blue. Although taste is a personal thing to me the Purple sneakers are the most funky and have the most personality. Puma made with the Burst Alt Womens trainer a winner. The simple sneakers are a great combination of elegant shoes and athletic footwear. The purple sneakers are made for comfortability. They have a velcro closure system. The new SPRK foam gives the Puma Burst Alt. a lot of comfort so you can wear them easily all day. The purple sneakers are a low to the ground design which gives them a lightweight look. Some sneakers you come across can have a bulky feeling, like you’re wearing a couple of stones. Luckily Puma is one of the brands that keeps innovating. Puma’s new SprkFoam is used for a soft, cushioned feel. And the mono mesh allows you to see the different layers in the upper while offering plenty of breathability for all your stylish needs. This all sound high tech, which it is in a way but in the end it means that the shoes have a soft feel around your feet. 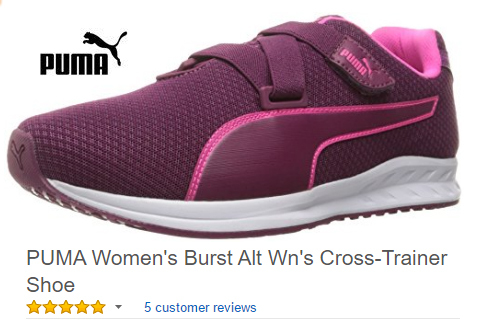 The Puma Burst is a huge series which not only includes sneakers without laces for women like the purple sneakers below but also the more conventional sneaker designs. Puma Burst purple sneakers for women, funky trainers without laces.